The Florida Gators picked up some key players on February’s National Signing Day, filling in some big holes and only really missing out one expected target. That miss was Washington, D.C. cornerback Noah Boykin opting for Notre Dame, which surprised pretty much everyone. Beyond that, though, Dan Mullen landed the prospects he was supposed to, setting up a nice first class. The haul may not be done entirely, as top JUCO defensive end Dorian Gerald is a priority for the Gators and will make his decision on Friday. Without counting that chicken before it hatches, here’s what we can say on Wednesday about this haul. For the entirety of this piece, I’m using the 247 Sports Composite, which combines the major recruiting services into a single metric. First, the replenishing of the Gator roster with blue chip recruits is continuing after a good effort a year ago. In recruiting parlance, “blue chip” refers to players with 4-star or 5-star ratings. While ratings can be wildly wrong for individual players, in the aggregate, they do a good job of telling you about the talent of a team. 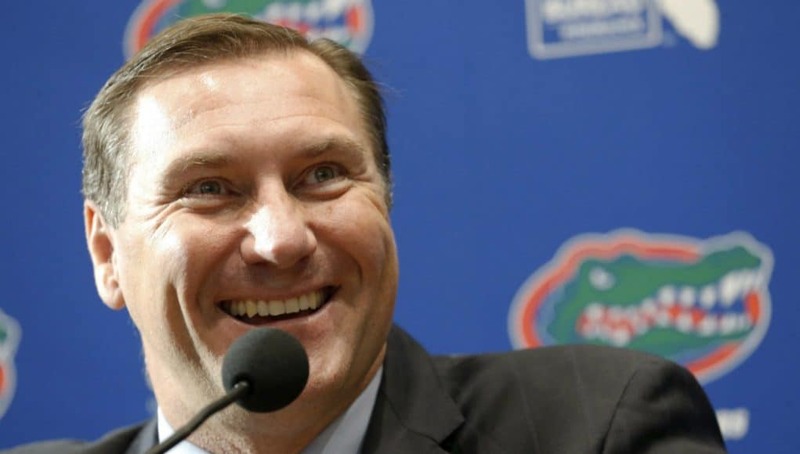 Florida hit the skids with blue chip recruits following the 4-8 debacle in 2013. Keeping Will Muschamp for what appeared to be — and turned out to be — a lame duck year set UF back in recruiting. The Gators signed nine blue chips in 2014, the lowest since getting just six in Urban Meyer’s first class in 2005. They then got only five in 2015 in Jim McElwain’s first class, and one of them (D’Anfernee McGriff) didn’t qualify and never made it to school. They bounced back to nine in 2016, but that was still a third straight year without getting into the double digits. McElwain’s strong close in 2017 brought in 11 blue chips, but two are already off the roster. James Robinson had a medical disqualification because of a heart condition, while Kadeem Telfort never played due to the credit card scandal and has since transferred. For all practical purposes, only nine really count anymore. Mullen picked up 12 blue chip recruits this cycle, a number that will stick because Gerald just barely missed out on a fourth star in the Composite and holds a 3-star rating. That’s half of the 24 total blue chip prospects that McElwain brought in during his whole tenure, not counting McGriff. The 2018 class has seven offensive blue chip players. That’s half of the 14 that McElwain signed in three years, and it’s more than half if you discount Robinson and/or Telfort. This cycle has five defensive blue chip players. That’s half of the ten that McElwain brought in if, again, you don’t count McGriff. In short, Mullen’s first class is a marked improvement over anything McElwain signed. Even last year’s class, whose final rank of 11th is higher than what this class will have, was not as big on top talent as this year’s bunch. Mullen signed 12 blue chips versus 11 a year ago, and even if Gerald signs on Friday, the class will have a blue chip composition of at least 63.1% (not counting 3-star Randy Russell, who like Robinson has a disqualifying heart condition, in the total). The 2017 group had a blue chip percentage of 47.8%. 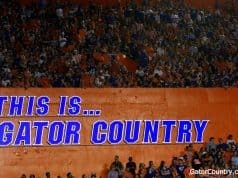 Florida has had coaches with transitional classes five times in the span that the Composite covers. Only Muschamp’s transitional class in 2011 had a blue chip percentage above half at 57.9%. Ron Zook and Meyer’s transitional classes were in the low 40s, while McElwain’s was just under 20% composed of blue chip players. Considering that two 4-star players from Muschamp’s transitional class transferred by mid-May in 2011, the real blue chip percentage of that class is more like 52.9%. Mullen’s rate looks even better in comparison right now, assuming no attrition strikes. 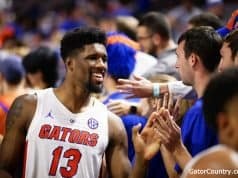 So, by Florida’s recent standards and in comparison to other UF transitional efforts, the 2018 class is a big success. UF held its own compared to some of its rivals as well. The dozen blue chip players the Gators got is a comparable number to FSU and LSU signing 13 each. It’s also 50% more than the eight that Tennessee ended up with. It’s well behind Georgia, however, as Kirby Smart has turned that program into a recruiting powerhouse. UGA got 22 blue chips this year after signing 20 last year. That’s 44 in two years, more than the 37 blue chips UF has signed in the last four years combined (34 not counting McGriff, Robinson, or Telfort). For comparison, Meyer only ever got past 18 blue chips once in Gainesville, when he signed 22 in his final class in 2010. Smart only got 14 blue chips (out of 23 signees, 60.8%) in his transitional class, though, and that was after taking over a program in far better recruiting shape than UF was in when Mullen got here. 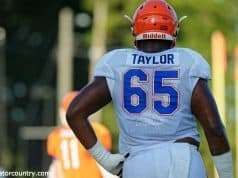 It will take a lot of hard work to get the Gators to where UGA is in recruiting right now, but if Florida’s football product on the field this fall looks fun, that will go a long way in helping UF get there. As Mullen noted in his signing day press conference, we won’t know until three years down the road just how good this class is. What we can say right now is that Mullen turned in about as good a class as could reasonably be expected given the circumstances. As the staff now turns the page towards 2019, their job will be to remove “given the circumstances” from that last sentence in the evaluations of next year’s class.